Nature and green spaces are conducive to both health and learning. Green spaces have been shown to contribute to health and well being and this appears to be especially true for children. Research shows that both teachers and students benefit from exposure to green spaces. Kids who are exposed to the outdoors not only learn better they are also more physically active which contributes to their overall well being. Even children suffering from learning disabilities like ADHD appear to benefit from exposure to green spaces. 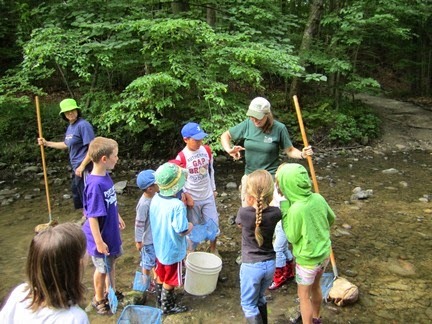 Students are not the only ones who benefit from an outdoor education. It would appear that teachers also benefit which in turn offers added value to the children they are teaching. According to a study from King's College London, teaching outdoors makes educators more confident and enthusiastic about their work, and more innovative in their teaching strategies. There are a number of innovative approaches to education that take kids into nature. One school that practices this approach is the Toronto District School Board's Forest Valley Outdoor Education Centre. There are a growing number of resources to help educators who wish to teach their children in natural settings. The David Suzuki Foundation, offer workshops for educators interested in taking students outside. The Foundation's Connecting With Nature guides is a prime example. This guide is intended for children from kindergarten through Grade 8. It includes lesson plans, step-by-step instructions and ideas for engaging local communities. Learning in green spaces also helps sensitize children and teachers to the value of nature and therefore increases the likelihood that they will work to protect it.